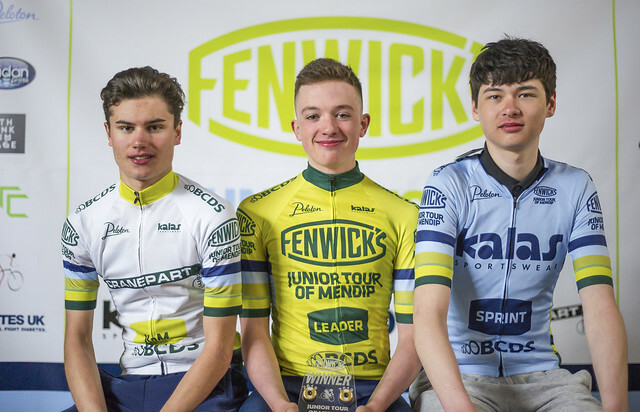 VC Londres racer Leo Hayter out-sprinted the bunch at the top of Harptree Hill to win his first-ever British Cycling Junior Road Series stage race at The Fenwick’s Tour of Mendips. Having taken the yellow jersey with his win in the Prologue Time Trial on the previous day, Hayter was disappointed to relinquish it again after a frustrating afternoon's second-stage 2 road race and came out on Sunday morning with the bit between his teeth. With the belief he could win the final stage and secure the title if he was in contention on the final climb, Hayter started the race in composed fashion, keeping fresh and choosing to sit in the group to conserve his energy. Stage Three’s race was an aggressive affair with riders averaging over 23 mph on the bitterly cold and windy day in Somerset. It was Kevin McCambridge, Ireland, that made the early break, pulling away to open a 30 second gap after the 2nd KOM climb. He was soon joined by 4 other riders Logan Maclean (Spokes Racing Team), Tom Couzins,(Central), Dylan Wesley (HMT Hospitals Giant Team) and George Mill-Keeling (Cycle Club Bridgnorth) who tried to stretch the race and get away from the chasing bunch. They were eventually caught as the race entered the village of Harptree for the second time and the whole peloton climbed Harptree Hill as one large group. It was as the group went over the top of the Hill and entered the final circuit of the race that 8 riders made the decisive breakaway. Led by Hayter the group put the hammer down and stretched out to a 56 second lead on the peloton through the villages of Chewton Mendip and Litton. With the finishing climb in sight a small group of five riders tried to bridge the gap and chase down the leaders, getting to within 100 metres, but having spent so much energy trying to chase them down they were again soon dropped as the race headed up Harptree Hill for the final time. It was Hayter who had the the deepest reserves in the final 400 metres, powering his way to the front and beating Oliver Rees (HMT Hospitals Giant Team) and Owain Roberts (Wales), by just one second. The stage win and bonus points jumped Hayter back to the top in the General Classification ahead of Rees and Tosh Teare of Equiom IOM Junior Cycling Team. "I found myself doing a lot of work trying to go against teams on my own and lost it in the finish yesterday. "I knew I could bring it back on today's stage because of the climb. With such big time bonuses on the finish, I knew if I could get up there and get the 30 seconds, I'd have the general classification overall. "I've never won a stage race before so I'm really happy with the result."